Not sure if you need EBSS? Check Out the FREE The Building Blocks Execution Excellence Audit to learn about the potential negative impact of execution levels on your organization or about where your execution problems lie. 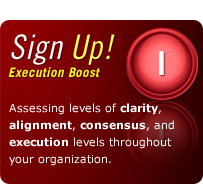 Moving your organization beyond the “Knowing-Doing Gap” into Execution Excellence. The purpose of the EBSS is to assist organizations, teams, and individuals to consistently identify and accomplish their most important objectives. The EBSS helps to boost organization-wide execution levels while enhancing the personal effectiveness of the individuals making up the organization. The Execution Boost Support System (EBSS)TM will help you create an organizational culture that is energizing and supportive, leverage more of the talents and abilities of your people, and provide the foundation for consistent organizational excellence. The EBSS is a set of trainings with robust online assessment and reporting tools that can be experienced in either an on site or completely on line manner. These trainings and online tools help organizations identify their most critical objectives, check consensus throughout the staff on those key objectives and put specific, measurable and agreed upon goals in to place to boost execution in powerful and purposeful ways. Included in this system are follow-up mechanisms to ensure that all goals are constantly being monitored, updated, facilitated, and rewarded in ways that powerfully reinforce quality execution. Also included in the EBSS are goal barrier tracking assessments, which allow leaders to have a “real time” look into the major reasons why certain goals are not being accomplished. The EBSS also includes a training component available for teams or individuals who struggle to execute at high levels, based on the components that are most helpful to boosting personal and team effectiveness. All Execution Boost Support System trainings consist of presentation, interaction, discussion, and both group and individual work. The EBSS was created to fit all budgets; the cost of each phase of the EBSS is between $500- $10,000 (depending on number of participants and the structure chosen). Step 1: identifying clear objectives that are most urgent and/or important to your organization. Step 2: gaining consensus about which objective should be focused on first, second, etc. Step 3: creating, prioritizing, and gaining consensus on SMART goals for each objective in order of their priority to your organization. Step 4: distributing SMART goals to the "right people" (those who are most likely to achieve them in quality ways). Part 1 (Goal Progress Summaries): gives leaders a quick and easy way to regularly check on both individual and team goal progress over the course of a week, month, quarter, and/or year. Part 2 (Goal Barrier Analyses): provides leaders a thorough analysis of the major barriers to their team’s collective goal achievement. This analysis is based on over 7 years of experience and research working with the most common barriers to consistent goal achievement. Who Needs The Execution Boost Support System (EBSS)? The EBSS is a strong alternative to the leadership and management processes that so often leave objectives unfulfilled (between 50-90% of the time, actually) – or even unidentified – in meaningful ways. With its state-of-the-art goal development and goal tracking devices, along with its dynamic customized reward distribution systems, the EBSS will help you will see more objectives meaningfully identified and more consistently fulfilled in quality ways (or at least have your finger on the pulse of exactly WHY these initiatives aren't being fulfilled within your organization). Come across as reflective, calm and visionary amid chaos. In the current business environment, many variables (such as the increased competition levels that come with globalization and the critical need to retain your most talented individuals) are making execution even more critical to the success – and even survival – of your organization. Once your strategy is determined, execution is often the only thing that separates you from your competition. The Execution Boost Support System (EBSS)™ will help you create an organizational culture that is energizing and supportive, leverage more of the talents and abilities of your people, and provide the foundation for consistent organizational excellence. We know that during these competitive times, there is not always time or money for on site trainings requiring a full or half day of your key people’s time. The EBSS has been carefully developed to fit all types of budget and time constraints. Choose from among the following EBSS structures – or work with us to create a structure that best fits your personal and organizational needs. Full day on site initial training to identify critical organizational goals and distribute them to the right people, backed up by online systems to monitor and assess organization-wide execution levels and barriers to goal achievement. Follow up trainings can also be ordered after pinpointing execution needs. Or, order the same process as above with a ½ day initial training. Don’t have the time or budget to get everyone together even once? Experience the EBSS completely online, backed up by phone consultations to train key individuals in how to execute the EBSS process for your entire organization. Choose the one-on-one training format that best fits your needs: on site, phone conferences, online assessments, or a combination of all three. The EBSS can also be experienced in a 2-3 day retreat format, upon request.